When Robert Zoellick ’75 declined both his recently announced honorary degree as well as the offer to speak at this year’s Commencement, a campus discussion about the influential public servant came to an abrupt halt. But the discussion that led to Zoellick’s selection had occurred months earlier, in an annual process that also selected activist and novelist Lorene Cary and humanitarian and entrepreneur Tralance Addy ’69. According to members of the Honorary Degree Committee, that selection process contained little of the animosity and emotion that characterized many of the arguments made by students in recent weeks. 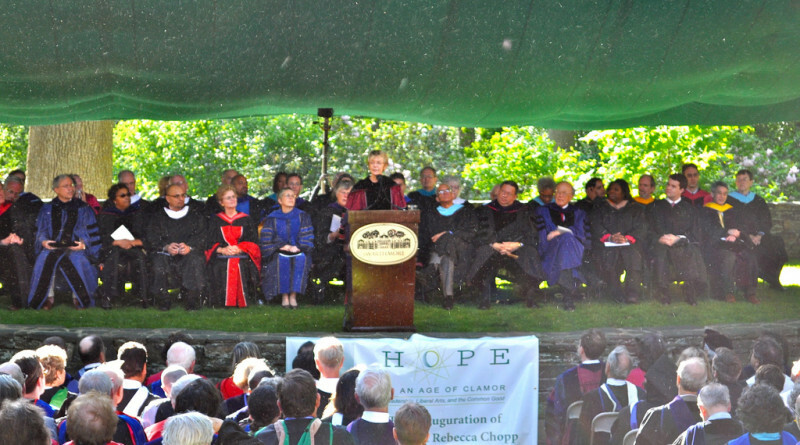 The Honorary Degree Committee is comprised of 10 members, which every year includes President Rebecca Chopp and Vice President for College and Community Relations Maurice Eldridge ’61. The committee also includes members of the faculty and Board of Managers, the latter tapped by Board Chair Gil Kemp ‘72, who rotate out each year, according to Board member Rhonda Cohen ’76, who served on the committee this year. The committee reviews a list of nominees submitted by faculty, alumni, and students during the fall. The committee holds a series of meetings, at least one of which was held at Chopp’s house, according to Cohen. Eventually, the group comes to a consensus about which nominees they will recommend at an all-faculty meeting. Then the faculty discusses the recommendees and, when no one is actively opposed to doing so, vote. That counts as consensus, said Political Science Professor Ben Berger, who sat on the committee in one of the rotating faculty positions. The recommendees approved by the faculty each receive honorary degrees and are asked to speak at Commencement. At the faculty meeting to discuss the committee’s recommendations, Berger said several people did express concerns about selecting Zoellick. Through discussion, however, the group “came to a broad consensus that was pretty overwhelming.” While not every faculty member voted for Zoellick, he said, there remained no active dissent by the time the vote was taken. Since the late 1990s, the Honorary Degree Committee has selected approximately three people annually, not all necessarily alumni, to receive degrees. Most other colleges, even if they award degrees to multiple people, have only one speaker. Different members of the committee described the purpose of the Commencement speeches in different ways. “Typically the point is not only to honor the folks but to let them share some of their wisdom and knowledge of life after college with the graduates,” Eldridge said. Berger said that honorary degree recipients should be role models for Swarthmore students, even if no one role model appealed to the whole student body. “Not every [student] is going to be a social activist, not everybody’s going to be a Quaker, not everyone’s going to be an actor, like Stephen Lang [’73] is, but a role model for some substantial part of the community, both undergraduates and alumni,” Berger said. Chopp and Eldridge separately pointed out that if students want a greater say in who is selected, they are welcome to nominate honorary degree candidates, a process that occurs online and by mail. A significant emphasis is also placed on diversity, particularly with regard to occupation, gender, age, race, and ethnicity, among other factors. The goal, explains Eldridge, is to invite speakers that, over the course of several years, collectively represent the diversity of Swarthmore’s alumni. The webpage also stipulates that candidates be good public speakers, but the committee isn’t seeking headline-grabbing names. “Sometimes there is this pressure to bring in a ‘great’ speaker, kind of like the LSE, and that’s just not our way,” Chopp said. “I think we have a particular Swarthmore understanding that we expect our graduates to use their knowledge to improve the world in however they define that. We don’t have one narrow, set definition of what that means,” Chopp said. 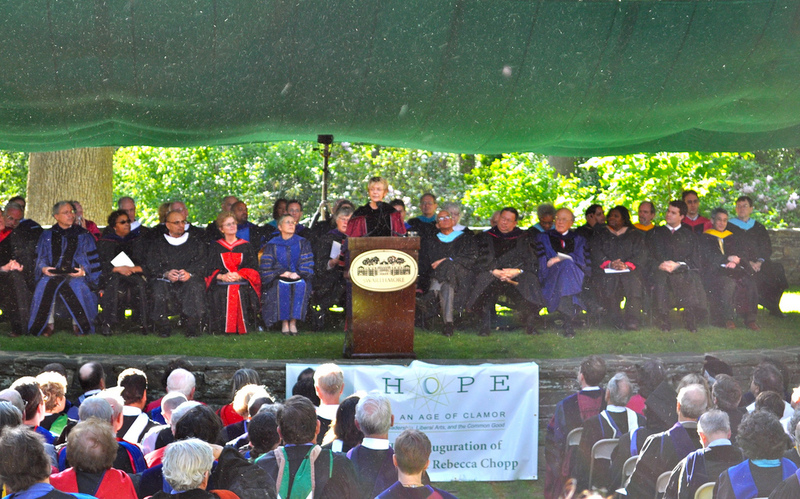 In a sense, the four committee members painted a picture of a Commencement aimed at showcasing the good to be found in everyone—the “light,” in Chopp’s Quaker-evoking language. Berger said that in his experience the committee’s discussions did not focus on what some might consider negative aspects of the nominees, instead focusing on merits. “It was really about fit. That’s not a negative thing, [like] asking ‘will they be disliked?’” he said. Committee members also said that they don’t make decisions based on the political orientations of the candidates. This year, that ideological neutrality was all too evident for some students upset at the selection of Robert Zoellick as a recipient. “Everybody around the table I’m pretty sure was on the left, and they felt comfortable about the fact” that Zoellick was more to the right, said Berger. “We know we’re not just picking [people] like us because this guy is not like most of us” in terms of politics, he said. Cohen, the Board member, was more direct. “We don’t overly take into account political positions,” she said. Some students, alumni, and faculty might disagree with such a policy, but Chopp indicated that a don’t-take-sides philosophy pervades her vision for College decisions that involve selecting individuals. “We don’t have any of that kind of litmus test of any one issue,” she said. “I would be very opposed to any ideological purity test,” whether for students, faculty, staff, or honorary degree recipients. Eldridge pointed to Patrick Awuah ’89, who received an honorary degree in 2004, as someone who was selected with, as Eldridge claimed, zero regard for his political views. The committee “had no sense of his politics,” Eldridge said, and recommended him based on the fact that he founded Ashesi University College, a liberal arts college in Ghana. Eldridge said he was not interested in deciphering any political preferences Awuah might have held in his prior career at the Microsoft Corporation. Berger aimed outside the sphere of Swarthmore to make a similar point. “I’m pretty sure that when Notre Dame invited Barack Obama to speak [in 2009], that people there didn’t say that ‘therefore, everything he’s stood for and done, not only do we Notre Dame stand for and agree with but so does everybody on the committee and so on,’” he said. “I think we feel a bit like that, too.” Obama was booed at several points during that Commencement speech, but he delivered it in full. The photo was taken by our current Coordinating Editor, Ellen Sanchez-Huerta, during Commencement 2010, which also served as President Chopp’s inauguration–aka “installation.” This is one of the photos we tuck away in our publicly accessible Flickr account for storage. There are more there if you’d like to check them out. Please email me at akaras1@swarthmore.edu if you have trouble viewing the photos.